This day is usually very interesting for all football fans except Arsenal fans. This time it looks like that Wenger missed the opportunity to bring the right players to Emirates stadium earlier and it looks like busy day also for us. It’s difficult to say if it is bad or very bad, but last three premiership matches showed that we really need new faces in our squad. Wenger didn’t manage to keep his main stars in the team and we now looks much weaker then last season. With the relegation form from Carling Cup final (2 wins from the last 14 premier league matches) it looks clear that without 4-5 new faces this team will not be in the top 4 anymore. After the match, Ferguson offered Arsene Wenger 3 cakes since he felt pity for him, but Arsene didn’t accept to eat cuz he already 8 2. This cleary insn’t the way how we want to be Arsenal known so ahead of the transfer deadline day we should expect new deals to be accepted. Now, I will make the summary of Arsenal squad and try to find places which need to get stronger: Goalkeepers, I would say we have enough quality, Wojciech Sczeszny and Lukas Fabianski showed what they are capable of last season and Manuel Almunia(if doesn’t leave) with Vito Mannone are also quality backups. Right fullbacks are in similar way, Bacary Sagna is proved quality and Carl Jenkinson also showed his abillity so don’t need to bring new faces. The first problem come when we started to talk about central defenders. We have one worldclass, but injury prone Thomas Vermaelen and two good ones Laurent Koscielny and Johan Djourou. The rest are not good enough(Miquel needs experience and rather not to talk about Squillaci). 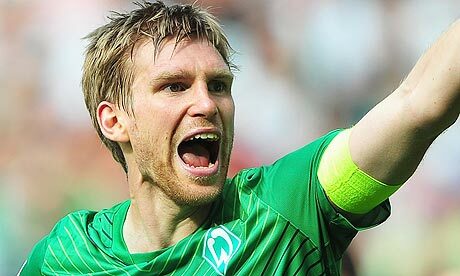 So we could expect one signing here and it looks to be Per Mertesacker from Werder Bremen. He is Germany international, with 75 call ups at 26, great signing. He also had two World cup medals. And for £8m, it is a bargain. Together with him, we could bring another defender, this time left back. With the only one first team left back Kieran Gibbs, who is also very injury prone, this is the position where we need to buy most. And on the way to Emirates is Brazilian leftback Andre Santos. He has 22 caps for Brasil and played previously for Fenerbache Istanbul. Don’t know him so much so I really looking forward to see him in Arsenal colours. Hope he will be good signing. Midfield looked solid last year, but after departures of Samir Nasri and Cesc Fabregas, we are toothless. So another playmaker is needed, but I have no clue, who it would be. Gossips are that it could be Benayoun, Martin, Arteta, Kaka or M’Villa, but no firm interest. The last category are strikers and with Van Persie, Bendtner, Chamakh, Afobe and most recently Chu Young Park it is clear that somebody should leave. The question if Chamakh on loan to Granada or Bordeaux or Bendtner to a permanent move away (Stoke, PSG, Hamburg or Bremen). We need to wait just around 11 hours. So the biggest question is about our midfielders and I hope that all the transfers will make arsenal stronger and able to fight for top four. I am sure that this is not the start of the end of Wenger’s era. In Arsene, we trust.